Brooklyn Fireproof Sash & Door Co. 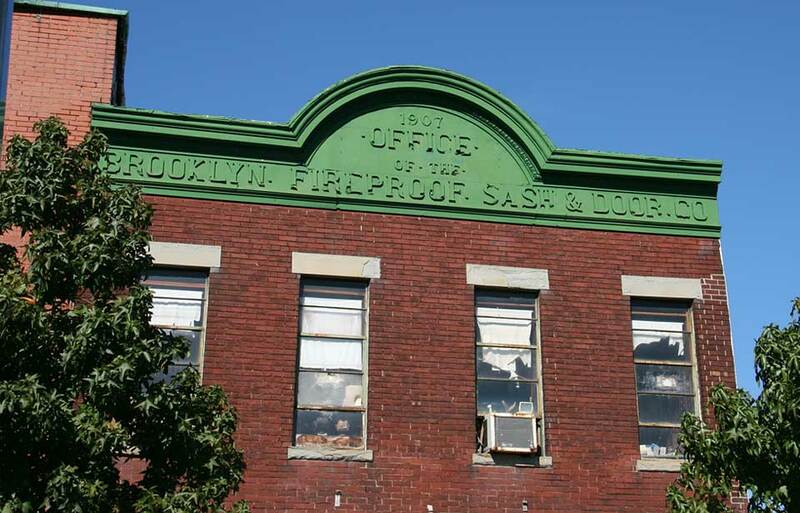 The Brooklyn Fireproof Sash & Door Co. was founded in 1902 when they were located at 671 Manhattan Ave. in Greenpoint. Brooklyn. They moved to Richardson St. in 1905 (their address was 97 Richardson St.) and erected this building in 1907. The plaque beside the door reads "Brooklyn Fire Proof / 101 richardson street," but this building is probably 103 Richardson St. The building adjoining to the immediate west (97-101 Richardson St.) was probably erected at the same time. The cornice is similar in design and inscription (click for image). The next building west on the northeast corner of Leonard St. (87-95 Richardson St.) was also part of the Brooklyn Fireproof Sash & Door complex. Polk's 1933-34 Brooklyn City Directory lists David Kahr and Samuel Meltzer as officers in the company. David Kahr (1873-1951), born 15 Sept. 1873, was an immigrant from Russia, who seems to have founded the company. He registered for the World War I draft in 1918 when he was 45 years old and lived at 102 W. 119th St., Manhattan. He gave his employment as "Manufacturer, Self, 89-105 Richardson St., Bklyn, Kings, N.Y." Samuel Meltzer (1872-1949), born 25 Sept. 1872, was also an immigrant from Russia. He registered for the World War I draft in 1918 when he was 45 years old and lived at 295 Pulaski St, Brooklyn. He gave his employment as "Carpenter, Brooklyn Fireproof Sash & Door Co., 97 Richardson St., Brooklyn, NY." This ad for the Brooklyn Fireproof Sash & Door Co. appeared in the Real Estate Record & Builders' Guide, 15 Feb. 1908. Two Brooklyn Fireproof Sash & Door contracts located through internet sources were apartment houses located at 204th St. and Seaman Ave. (1917), and 103rd St. and West End Ave. (1920). The 1917 contract specified "Kalamein work let to Brooklyn Fireproof Sash & Door Co." The term "kalamein" apparently means fixing metal plates to wooden doors to prevent the spread of fire. The Dictionary of Construction.com defines a kalamein door as "A fire door whose solid wood core is usually covered with galvanized sheet metal." The last entry for Brooklyn Fireproof Sash & Door Co. in the Brooklyn telephone directory was in 1941. On his death in 1951 David Kahr had this obituary notice in the New York Times, 29 Jan. 1951, "David Y. Kahr, founder and former president of the Aetna Products Corporation, 730 Fifth Avenue, died on Friday at his residence, 515 West End Avenue, after an illness of five years. His age was 75. Mr. Kahr had been in business in New York for fifty years. He leaves his wife, Fannie L.; four sons and three sisters." What is referred to in the obituary as Aetna Products Corp. was actually Aetna Steel Products Corp. Incorporated in 1925, Aetna Steel Products was listed in the New York telephone directory from 1934 through 1941 at 101 Richardson St., Brooklyn. Offices were located on Church St., Manhattan. This ad for Aetna Steel Products appeared in Chemical Engineering Catalog, 1917 edition. A Kahr Bearing Division of Aetna Steel Products Corp. and Kahr Bearing Corp. were listed in the New York telephone directory from 1954 to 1967.